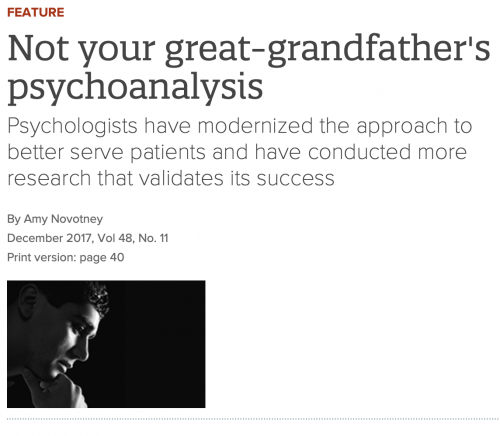 Last month the official monthly magazine of the American Psychological Association, Monitor on Psychology, featured an article on psychoanalysis and its current relevance as a form of treatment. http://www.apa.org/monitor/2017/12/psychoanalysis.aspx The bottom line is that the psychoanalytic approach, long ignored as behavioral treatments promised quicker fixes, is making a comeback. And a well-deserved one. The article cites evidence that psychodynamic and psychoanalytic work is at least as effective as CBT and the effects last much longer. There is also a nice, brief comparison of psychoanalysis versus psychodynamic therapy. In the thirty-plus years that I have been practicing, I have seen countless people who have tried briefer therapies at least once, if not two or three times. They experienced symptom relief for a while after their brief behavioral treatments ended. But eventually their symptoms and problems returned, often in a more severe form. At this point they started thinking about trying a treatment that goes deeper and lasts longer. There is no denying that a psychoanalytic approach is more costly in the short term. It takes more time, energy, and money to achieve the desired results. And I always tell my patients that they have to be willing to feel intense emotions—mostly painful ones–that are creating their symptoms or conflicts. Being a psychoanalytic patient takes commitment and courage. But the psychoanalytic experience can be a life-changing one that will never leave you.